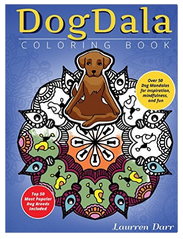 DogDala: Coloring Book is available in Paperback for $9.99. Gain clarity, focus, and peace coloring DogDalas – over 50 Dog mandalas & mantras/affirmations included… Mandalas are a form of therapy used by thousands worldwide. People seeking to calm their thoughts and increase their productivity color mandalas every day. Now, anyone with a love of dogs and a desire for clarity, have a source for those reflections in “DogDala.” Unlock your creativity with more than fifty DogDala designs included in “DogDala.” There are 50 of the top breeds represented in this coloring book. Also included are over fifty mantras (also called affirmations) for meditation during the coloring process. Breeds included: Akita, Alaskan Malamute, American Foxhound, Australian Shepherd, Basset Hound, Beagle, Bloodhound, Border Collie, Boxer, Brittany, Bulldog, Bull Terrier, Cane Corso, Cavalier King Charles Spaniel, Chihuahua, Chinese Crested, Chow-chow, Cocker Spaniel, Collie, Curly-Coated Retriever, Dachshund, Dalmatian, French Bulldog, German Shepherd, Great Dane, Irish Soft-coated Wheaten Terrier, Labrador Retriever, Mastiff, Newfoundland, Papillon, Pembroke Welsh Corgis, Pomeranian, Poodle, Pug, Rat Terrier, Rottweiler, Saint Bernard, Shih Tzu, Siberian Husky, Vizsla, Weimaraner, West Highland White Terrier, Yorkshire Terrier. Choose your medium, choose the DogDala to color, and enjoy. Turn your thoughts inward. Each of the designs were created for dog people and pet lovers to focus on coloring to relieve stress, increase the positive energy in their lives, and and have fun in the process! Many promising studies have been conducted on art therapy. For those who are less inclined to create art as therapy and wanting a simpler solution, they are using coloring books to enrich their lives. Physicians and therapists prescribe coloring for many different illnesses including depression, PTSD, dementia, and even cancer patients to reduce their pain and stress levels in treatment. Everyday, people are also looking for natural and joyful ways to lessen pain and reduce the tension in their lives. By coloring, the mind focuses. This, in turn, allows the brain to replace mind chatter and negative thoughts with positive thoughts. There are many benefits to having a coloring book routine, which include: Achieve a meditation state of mind. The alpha brain waves are present when the mind is sleeping or in a deep zen-like meditative state. When a person is coloring, the brain can get into this soothing, restorative mode. Assuage stress, worry, and fears. This happens in the amygdala portion of the brain where emotions and motivation are integrated. The amygdala gets calmed during the coloring process. Improve fine motor skills. This happens through the repetition of coloring and focusing on a task using your hands to stay within a finite area. Increase creativity. Coloring unlocks the right side of the brain and keeps it stimulated, allowing for more creative thoughts and solutions. This also leads to increased productivity. Relax, gain clarity, and focus. People can also reduce their blood pressure while coloring.